Few developments have so strongly influenced the course of music history as the invention of the piano. Its dominant position in today's music scene is due to Bartolomeo Cristofori, who built the very first gravicembalo col piano e forte, as the instrument was originally called. Cristofori was born in Padua in 1655, but otherwise very little is known about him. Grand Prince Ferdinando de' Medici appointed him in 1688 to tune and maintain the harpsichords at his court in Florence. Here he started to think about building an instrument which was capable of playing forte and piano. It seems that he developed the hammer action before the turn of the century. The first report about this new instrument was written by the poet Scipione Maffei in his Giornale de' Litterati d'Italia in 1711. Three original fortepianos of Cristofori have survived. The oldest dates from 1720 and is preserved in the Metropolitan Museum of Art in New York. The Museo Strumenti Musicali in Rome has a fortepiano from 1722, and the third is in the Grassi Museum in Leipzig. This instrument was built in 1726 and has been copied by Reiner Thiemann in Nuremberg in 1995. 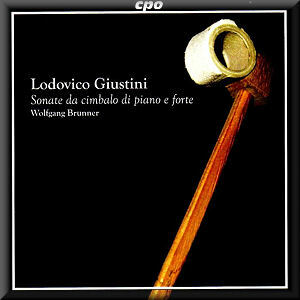 This copy is used here by Wolfgang Brunner in his recording of five of the 12 sonatas opus 1 Lodovico Giustini composed specifically for the fortepiano. This is indicated by the title: Sonate da cimbalo di piano e forte detto volgarmente di martelletti (Sonatas for harpsichord with piano and forte, commonly called harpsichord with hammers). They date from 1732 and were published in Florence the same year. These sonatas were composed at the request of the Brazilian priest and diplomat João de Seixas da Fonseca Borges and were meant as a welcome present for his patron Don Antonio de Braganza, brother of the Portuguese King João V. It is not quite clear why Lodovico Giustini received the commission for these sonatas. He wasn't exactly a widely known or famous composer. He was born and died in Pistoia, where he has worked all his life, mainly as an organist. Very little about his life is known, and nearly all other music from his pen has been lost; only some fragments from vocal works have survived. The fortepiano wasn't an immediate success. Some 30 years were to pass before the instrument was to become accepted by composers and performers. Most keyboard music from the 18th century, at least until the 1780s, could be played either on harpsichord or fortepiano. Even though the sonatas by Giustini include indications like piano and forte they can be performed at the harpsichord. That said it is understandable that Wolfgang Brunner, in his personal notes in the booklet, confesses he played some sonatas on the harpsichord, and was never really satisfied. He also played them on instruments of the late 18th century, and they sounded trifling to his ears. It was only when he was asked by Reiner Thiemann to present his copy of a Cristofori fortepiano that he found the ideal instrument on which to play Giustini's sonatas. That encouraged him to play some sonatas in concerts, and here he presents five of them. This is not the first or only recording. In the 1970s the legendary pianist Mieczyslaw Horszowski recorded all the sonatas on the 1720 Cristofori of the Metropolitan Museum of Art (for the American label Titanic). He had already played some of them on this instrument as early as 1952. This year (2010) a complete recording was released by Brilliant Classics, with the Italian keyboard player Andrea Coen on a copy of the same instrument of 1726 which Reiner Thiemann has copied. I haven't heard that recording yet, so I can't use it as a comparison to this disc. The present recording is a convincing plea for the fortepiano of Cristofori as well as the sonatas by Giustini. The instrument and the sonatas turn out to be an ideal match. I haven't heard this music at the harpsichord, but I can imagine that without the possibility to play piano and forte they wouldn't be as captivating as they are in this recording. That is also due to Wolfgang Brunner who really feels at home at the instrument. This selection gives a good impression of the quality and the variety of Giustini's sonatas. They have four or five movements, which mostly have an indication of the tempo (andante, allegro) and the character (giga, siciliana). Anyone interested in keyboard music is well advised to look for this recording. I would especially urge piano aficionados who don't like historical instruments to give this disc a try. They could at least pay tribute to the man who has laid the foundation of the instrument they value so highly. And maybe they will like the instrument after all.